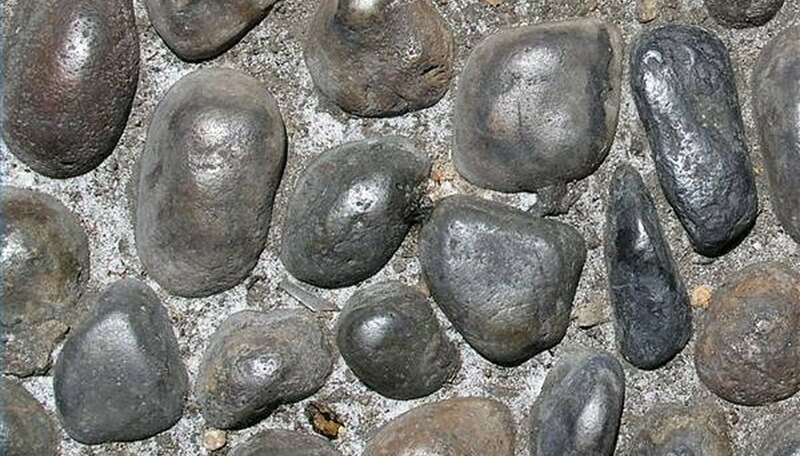 Pebbles embedded into a concrete driveway add elegance to a building. When people see a pebble driveway, they immediately think about the quality and care that has gone into its construction. This type of driveway is also more stylish and organic-looking compared to standard concrete. Select the rocks that you want to embed into the concrete. The rocks should be firm and smooth. Small rocks are the best and polished river rocks are perfect. Ideally, the rocks should be a size barely small enough to fit into your mouth with it closed. Please do not actually put the rocks into your mouth (it's not safe). Cut 6-inch strips from a piece of plywood using a skill saw. Measure these strips out as parallel lines on a sheet of plywood. Start by measuring 6 inches from the corner down either side of the length of the sheet. Use a straight 2-by-4 board as a ruler to trace between these two marks. Double-check the line by measuring it at locations other than the two edges to see if the line is 6 inches from the edge at all locations. Cut these strips of plywood with the skill saw. Make enough strips from the plywood sheets to make the cement form around the perimeter of your driveway. These will be forms where you pour your concrete later. Put them into a pile until you have enough to go around your driveway. Dig into the ground 6 inches deep. Use a sledge hammer to pack the dirt down everywhere you want to pour your driveway. Dig out the edges of this hole an extra 2 inches on the sides where you will drive the stakes. Cut stakes from 1-by-2 boards into lengths that are each 1 foot long. Make sure that when you cut these boards, you cut the end at a very steep angle to make a sharp point (sloping to one side only). Pound the 1-by-2 boards into the ground like tent stakes so that they support the outside of your forms. Space the stakes so that there is no more than 2 feet between the 1-by-2 stakes. Nail the forms to the stakes to keep then from slipping after the concrete is poured using roofing nails that are 1 1/2-inches long. If the front and back edges are up against pre-poured concrete, like a sidewalk or a foundation, simply lay the board directly against the layer of preexisting concrete. The wood can then be removed by prying it out from the side when the concrete is firm enough to hold its form (and after the rocks have been placed). Try to keep the concrete convexly curved in the center with a gradual decline towards the outer edges of the concrete or wherever you want the water to run. Place the re-bar to reinforce the concrete with the bars criss-crossing every 2 feet to form a grid (like lines on graph paper). Cut the re-bar with a hack saw so that it fits the lengths/widths of the concrete form. Tie the re-bar together where it crosses with a coat hanger wire so that it stays put. Suspend the re-bar off the ground by driving in short vertical sections of re-bar and tying the re-bar with the coat hanger. This will help ensure that the re-bar is in the middle of the concrete where it will do the most good. Mix the slow-curing concrete. You will need approximately one 80 lb. bag for 1 square foot of concrete in a driveway poured 6 inches deep. Use a rubber mixing tub and a square nosed concrete shovel to mix the concrete (or better yet, a rented concrete mixer). Spray the water into the concrete while you mix it around according to the directions on the bag. Mix well, adding the water a little at a time, so that the mix is moistened evenly to avoid clumps. Remember that you need to move quickly so that the concrete does not set before it is poured, skeeted (the flat 2-by-4 drug to smooth the top), and the stones embedded. Generally, the more water that you add above what is required to activate the chemical reaction, the weaker the driveway. Use a shovel to toss the concrete, filling one area at a time in a the section where you will work. Unless you rent a cement mixer, you may not be fast enough to pour and then add the rocks all at once before the concrete cures. You may have to enlist help from family members and friends (neighbors are great if you provide free pizza) to finish the job before the concrete sets up. Make sure that they understand exactly what you want them to do before the process starts and that you guide them as they work. Get a person on either side of the driveway and use the straight 2-by-4 board to flatten the concrete. Drag the board on either side to push the "wet" concrete into the corners and scrape off the top so that it looks flat. After a short scrape, use the board to tap the concrete flat. Put a plywood board on the concrete to walk on for access areas you will be working as they progress in form the edges to where you can't reach them otherwise. Start embedding the rocks into the driveway at one end and progress to the other end while working, with the plywood on the sections where the rocks were just embedded. Again, this is where friends can come in handy since time is limited by your concrete mixture which starts to cure the moment activates. Make sure that the board you walk on as you work presses on the tops of the rocks that you have already embedded to bring the tops of the rocks to a uniform level. Place the rocks into the concrete one by one the way that you want them to be in the concrete. Make sure that the rocks are embedded more than half-way into the concrete so that they stay in when the concrete cures since the biggest part is under the concrete. Make sure that the rocks somehow taper upwards before they start to leave the concrete. If you work on an area that is too large, you will have to resort to pouring the rocks on top and pressing down into the concrete to embed them. Wipe off the rocks with a wet rag to remove excess concrete. Use plenty of water and do this before allowing the concrete to cure. While waiting for the driveway to cure, keeping it moist with a light list from the garden spray nozzle and placing tarp over the top. If the weather is cold, do not allow the concrete to freeze while it is curing. Use a concrete saw (you rent) after the concrete has cured. The cure rate will depend on the weather and the type of mix you are using. Saw the driveway into even sections that are no more than 4-foot squares. If desired, measure your driveway and divide the driveway into parts that are all the same size (for uniformity). Seal the concrete and rock with a concrete sealer and protectant that you use to coat the surface so that it is water proof. First clean off the area you are working on with a broom to remove everything. This will require a bristle paint brush to coat into all of the nooks and crannies of the rocks. This will also add a nice shine to your work and make it last. Rocks are often given away online (check Craigslist and Freecycle) when people buy too much for their own projects. These extras can be used to add variety to the rocks that you buy yourself, but make sure that they are decoratively (or at least randomly) interspersed with the other stone that you lay. Put up barriers and signs to keep people from walking and driving on the concrete. Read and follow all instructions that come with the devices (including rental devices). Wear safety goggles at all times. Use a respirator to keep concrete and other debris out of your lungs when doing this project. Wear gloves and old clothes that you can ruin with concrete without concern. Don't let concrete set in your hair. Wash off any concrete that gets onto your skin.